When I think of what makes me happy, my thoughts go immediately to the countryside. Thinking about walking and taking in the sights and sounds, I realised that one of the things that adds to the enjoyment is to hear a bird singing loud and clear. Bird songs always seem to me a happy sound – as if the song bursts out because the bird is overjoyed with himself. As for the colour of the piece, for me it had to be bright and yellow is the first colour I think of for ‘Happy’. I found a piece of hand dyed linen which really summed up the feeling for me. I wanted to incorporate the countryside, but not in too literal a way, so I used geometric wooden block prints in green and gold tones to suggest fields in the background. 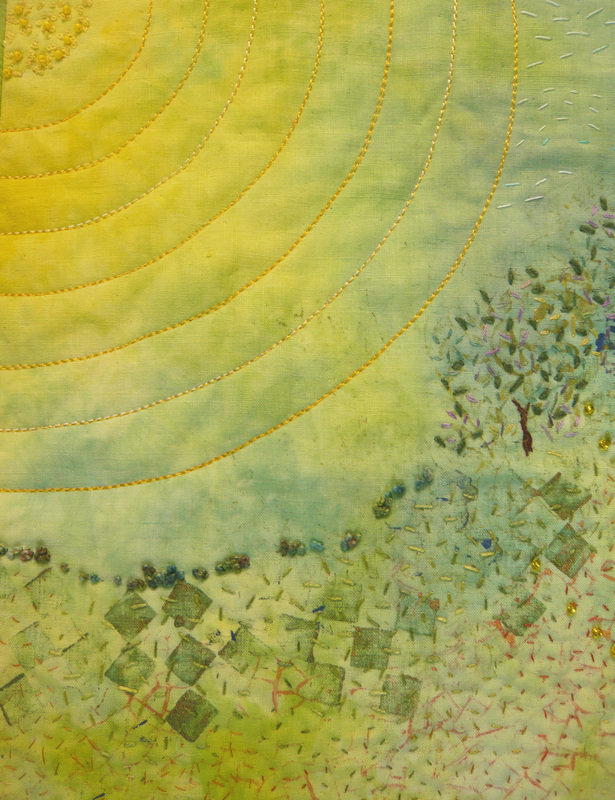 I added hand stitching to these areas to suggest hedgerows, field vegetation and distant trees. The tree branch is couched thread with transfer printed sheer fabric added for the green leaves. 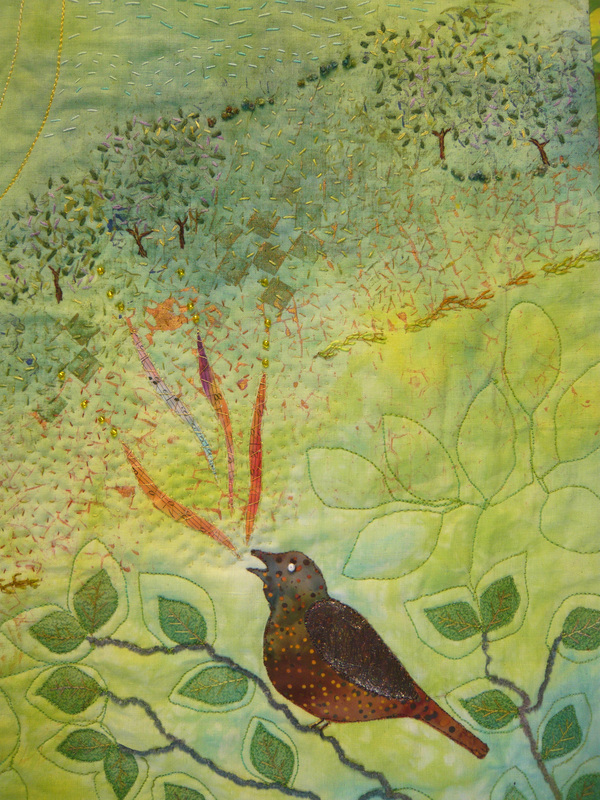 Machine quilted leaf shapes are added to the foreground to suggest the remainder of the tree, without distracting too much from the bird on the branch. The bird is cut from commercial fabric with Angelina fibres to give a glint in the wing, and a beady eye. I added cut shapes from painted music paper to denote the song, tipped with a few beads as the sound escapes into the air. Finally, I machine quilted radiating arcs of yellow to suggest the sun’s rays, with a few beads and French knots from which they radiate. I wanted to show that the bird is singing to the world. Joan what a happy quilt, the colours are very warm and inviting. 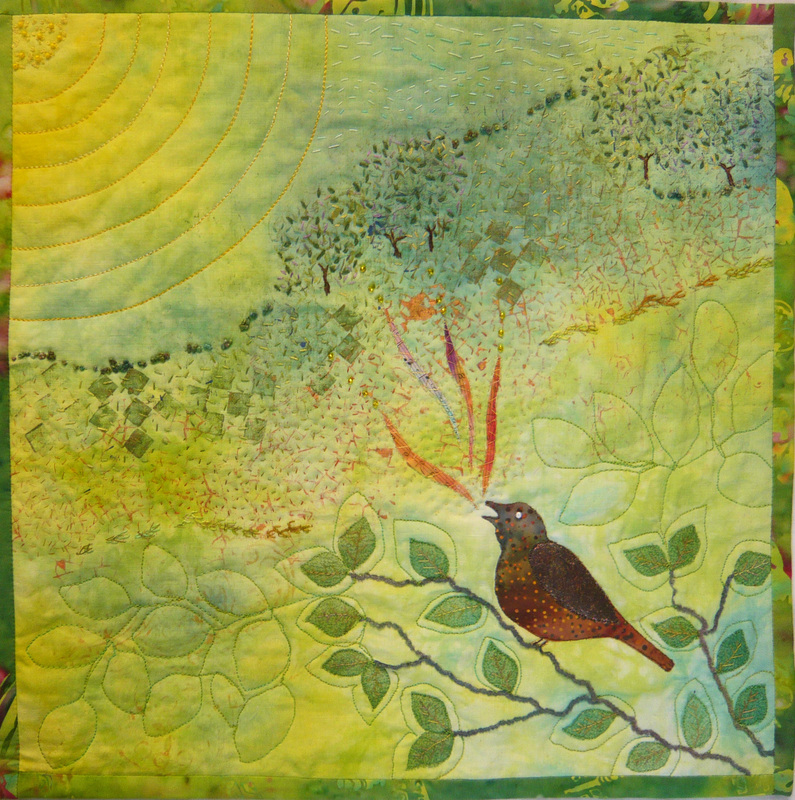 Very clever quilting and use of embellishments. The use of music was very innovative. I was immediately attracted by this singing bird, pure happiness. The colours and embellishments are well chosen. I love the simplicity of this piece which at the same time very poignant. This is so beautiful! Very nice how you used so many techniques. I love the distant trees. Well done.